2018 Exponential Center University Interns. From left to right: Maya Vishwanath (Tufts University), Catherine Wiedman (University of Virginia), Yuki Klotz-Burwell (Chapman University), and Hannah Levin (California Polytechnic State University). Embedded in Silicon Valley are themes of innovation, entrepreneurship, business, and technology, as well as deeply human stories. 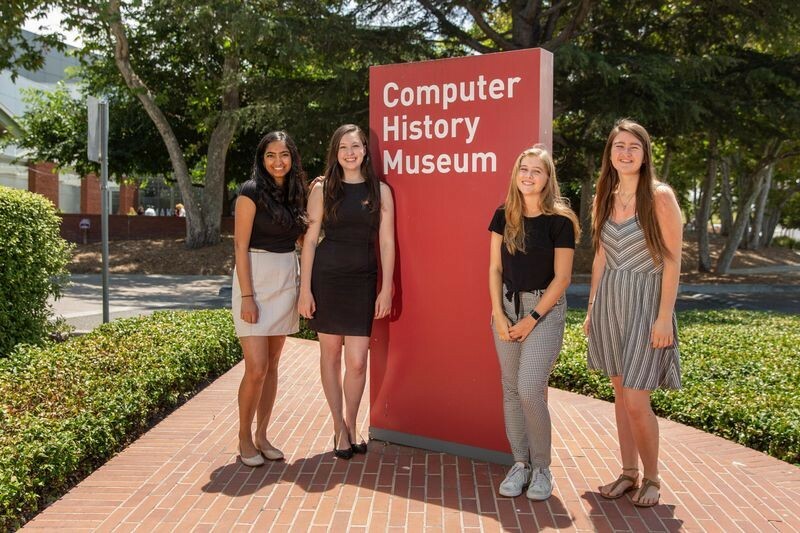 As interns with the Computer History Museum’s Exponential Center, the four of us—Maya, Yuki, Catherine, and Hannah—started our internship with little inside knowledge of these themes; at school we study a wide range of subjects, from English and environmental science to public relations and economics. But, over the course of the summer, through various research projects, events and programs, funding proposals, and exhibit development, we’ve gathered a lot of knowledge about Silicon Valley and its ecosystem. We’ve each picked one of our favorite artifacts in the Museum’s collection to share some of the information and insights we’ve gained this summer. For a long time, the idea of self-driving cars was a futuristic vision reserved for movies. In recent years, however, the presence of autonomous vehicles has been increasing. One of the pioneers in self-driving technology was the Waymo Firefly. Designed in 2013 and retired in 2017, the Firefly was Waymo’s prototype for a self-driving vehicle. The Firefly seats two people and has neither a steering wheel nor pedals. The car relies on sensors and software to drive; the distinctive dome on the roof allows it to create a 3D map of its surroundings using LiDAR. LiDAR calculates the distance to a target by illuminating the target with laser light and measuring the light that is reflected back. With its pod-like design, the Firefly was affectionately called a “koala car” or a “gumdrop”; the car’s rounded shape maximizes the sensor’s field of view. The Firefly can drive up to speeds of 25 miles per hour and has a safety driver aboard at all times. 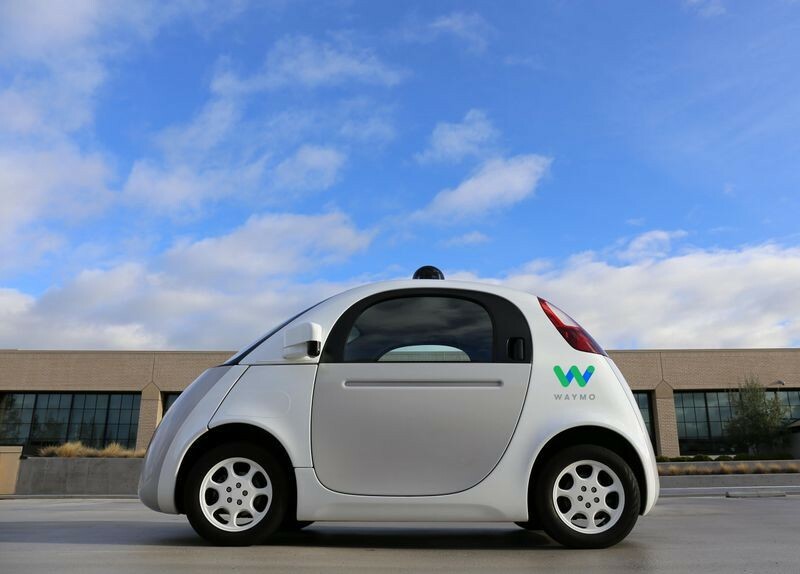 Waymo began in 2009 as Google’s self-driving car project, and since then the fleet has autonomously driven over 8 million miles. At first, Google used a modified Toyota Prius and modified Lexus SUVs, before designing the Firefly in 2013. The Firefly was an invaluable experiment; it taught Waymo engineers crucial lessons, such as where to place the sensors and what controls the passenger needs. On October 20, 2015, the Firefly completed the world’s first autonomously driven trip when Steve Mahan, who is legally blind, rode through the streets of Austin in a Firefly without controls. The Firefly was an experiment and was never intended for mass production; in June of 2017, Waymo announced it was retiring the Firefly in order to focus on putting its autonomous driving software into existing cars, such as its self-driving Chrysler Pacifica minivan. While you can no longer see the little Firefly cruising the streets of Mountain View, California, its legacy lives on in the exponential impact it had on the future of autonomous vehicles. You can see a Firefly inside the Computer History Museum’s exhibit Where To? A History of Autonomous Vehicles. 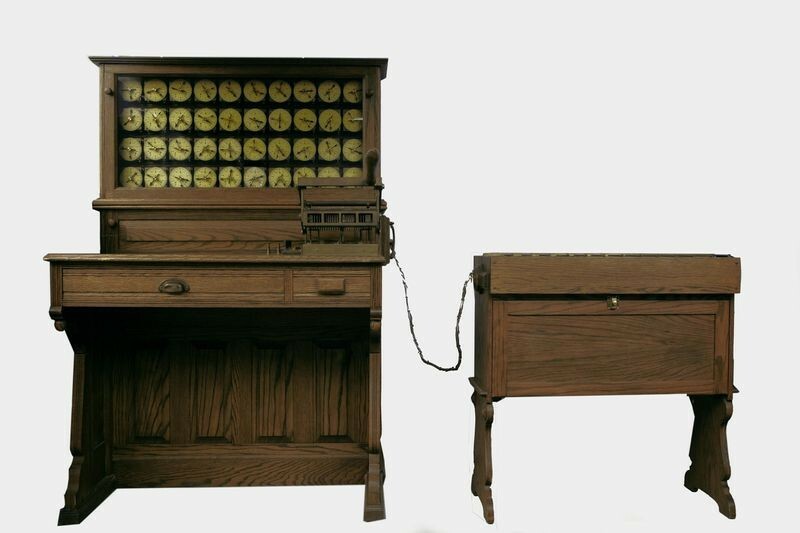 Hollerith Electric Tabulating System (replica), 1890 (replica: 1981) in Revolution: The First 2000 Years of Computing. Collection of the Computer History Museum, XD231.81/Photo: © Mark Richards. Before the 1890 census, population growth caused concern that collecting information on all 63 million Americans wouldn’t be finished before the next one began. A contest was held for the most capable data processing system. Herman Hollerith created the first automated tabulating machine using punched cards, securing both a patent in 1889 and a census competition win. Census takers recorded data on paper cards. To make the information readable, they would use a pantograph punch, which required aligning a pin and guide hole before punching the card. Each hole corresponded with a person’s information. Machines read the data; spring-loaded contacts were blocked by paper or passed through a hole, completing an electrical circuit. The information tallied onto the correct counter. Another machine recorded detailed patterns like married farmers over the age of 40. With 7,000 daily tabulations, this system allowed operators to perform ten times faster than in the previous census. Pantograph Card Punch, ca. 1900. Collection of the Computer History Museum, X1099.92/Photo: © Mark Richards. The concept of holes in cards representing information wasn’t new—Charles Babbage’s Analytical Engine, mechanical looms, and player pianos used the system—but Hollerith’s device was the first to show how the idea could have a broader impact. It’s incredible the scale of influence, or “exponential impact,” the machine had. Punched cards quickly became a computing staple. Information of all kinds could be recorded and processed, and filed cards stored the data. 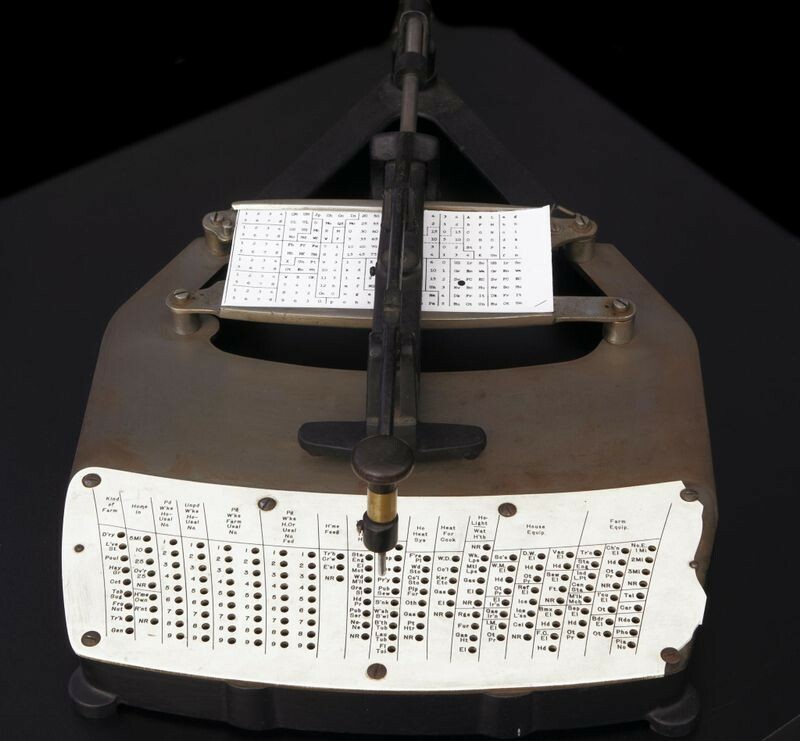 With its hole or no hole system—similar to binary code—punched cards served to bring data processing to traditional mathematics and remained in use until the 1970s. Compiling, organizing, manipulating, and printing data had never been easier. Hollerith’s Tabulating Machine Company combined with two other businesses. In 1924, Thomas Watson renamed that company to International Business Machines Corporation (IBM) and led the computing field. In 1935, the Social Security Act created retirement benefits for 30 million Americans. The immense amount of accounting data utilized punched cards. A 1940s study of British plants and animals kept records using the same system. Punching data was thought of as clerical work, and the growing number of employees tasked with the job was primarily female. Between its influence on government programs, scientific endeavors, and women in the workplace, the tradition of disruption we’ve found to exist in Silicon Valley today was clearly at work decades ago with Hollerith’s tabulating machine. Pixar image computer, 1986, in Revolution: The First 2000 Years of Computing. Collection of the Computer History Museum, 102621974/© Mark Richards. From Monster’s Inc. to Coco, Pixar’s heartwarming animations have made the company a household name. However, Pixar’s technology has impacted more than the movie world that it is known for. 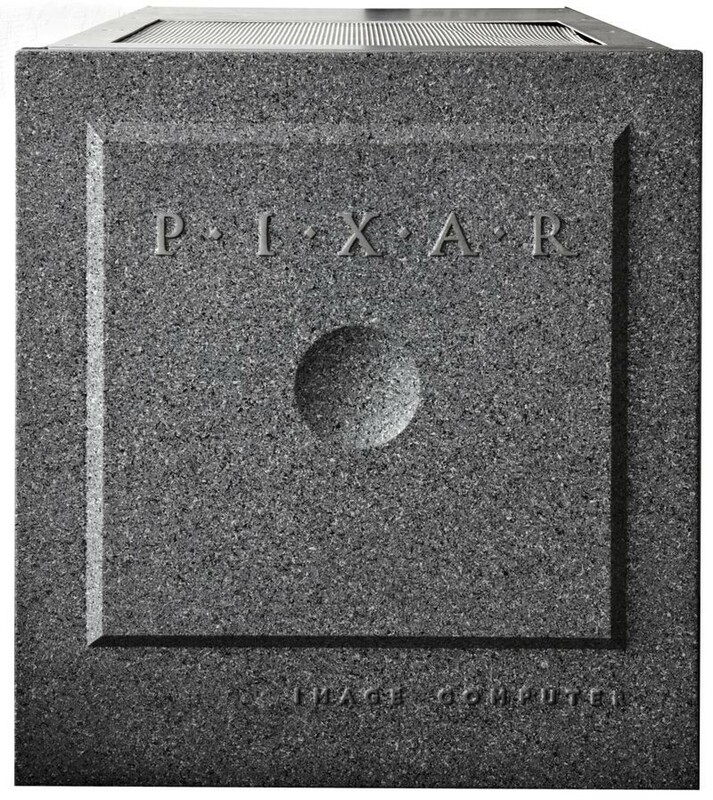 The Pixar Imaging Computer, created in 1986 by the graphics division of LucasFilm (later bought by Steve Jobs and renamed Pixar), was built to color hand-drawn images for Pixar and Disney’s cartoons. This machine helped develop the images used in Disney’s 1995 Pocahontas and Pixar’s 1987 short film Red’s Dream. While this imaging software was progressive in it’s own field, the technology was also highly impactful in the field of medicine. The complex visualization software of the Imaging Computer was able to render 3D digital models from CAT scan data, allowing doctors and scientists to rotate, examine, and slice the image for further examination. Ultimately, the system was not widely used at the time due to its memory constraints and cost. Despite this, the machine was well ahead of its time, and its impact upon the medical field highlights the far-reaching entrepreneurial spirit of Silicon Valley. The forward thinking visionaries of the graphics team at LucasFilm impacted not just their movie, but the future of Pixar’s computers, as well as graphics creation and medicine. The significance of the computer, despite its relative failure commercially, is a reflection upon how innovation in Silicon Valley, even now, can disrupt our current ideas of technology and impact our society in a variety of positive ways. Whether bringing smiles to our faces through the beautiful graphics of Pocahontas or providing an in-depth view within an CAT scan, the Pixar Imaging Computer relays the culture of the Silicon Valley ecosystem in which a small idea can serve greater humanity. Alto I mouse, keyboard and 5-key chording keyset, 1973, in Revolution: The First 2000 Years of Computing. Collection of the Computer History Museum, 102626737/© Mark Richards. Before personal computers were abundant and everyone had an Apple Watch on their wrists or a smartphone in their pockets, computers were only for use by technology professionals and specialists. With its ubiquity, I often take technology for granted, but we don’t realize how much they computers have evolved. Now, everyone from programmers to children can use computers, and it started with the Xerox Alto. The Xerox Alto was created at Xerox PARC (Palo Alto Research Center), and revolutionized the computer industry, and ultimately the way we work. With features including a mouse, removable data storage, “What You See Is What You Get” printing, and an easy graphics program, the Alto was incredibly user friendly and opened up technology for a new generation. 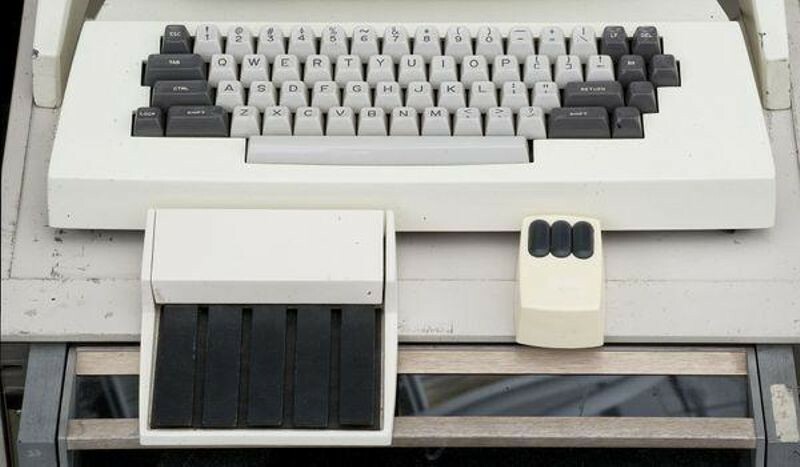 Alto I CPU with monitor, mouse, keyboard and 5-key chording keyset, 1973. Collection of the Computer History Museum, 102626737/© Mark Richards. The Xerox Alto also contributed to other impactful companies and products. While reading through an Oral History with Joanna Hoffman, one of the original Macintosh team members (publication forthcoming), I noticed that she mentions using the Xerox Alto behind Steve Jobs’ back to create a business plan for the Macintosh. The Alto’s graphics program supported her vision and helped her create a document that aligned with Jobs’s desired concept. Later on, Steve Jobs arranged for Apple engineers to view the Alto, giving them confirmation that utilizing a GUI would be successful, which eventually led to the production of the Apple Lisa and Macintosh. 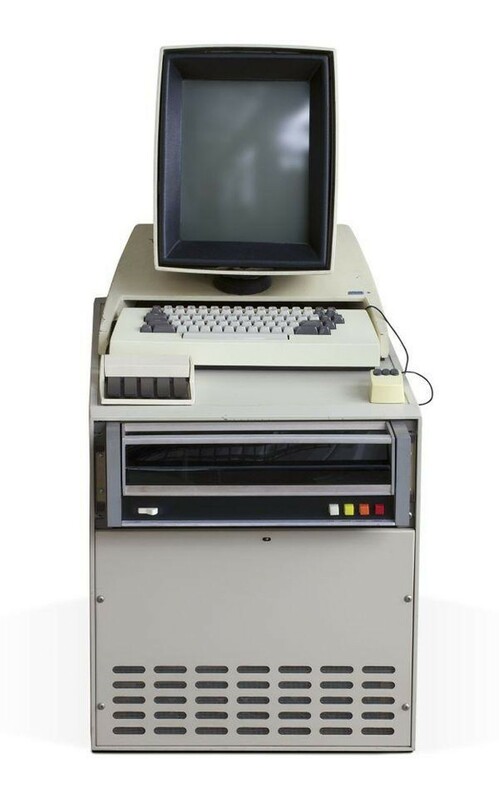 While the Xerox Alto wasn’t sold commercially, it still had a monumental impact that transformed the way humans interact with computers. They’ve now become a tool that we can easily adapt for our own needs, allowing us to do everything from solving a simple calculation to writing this blog post! 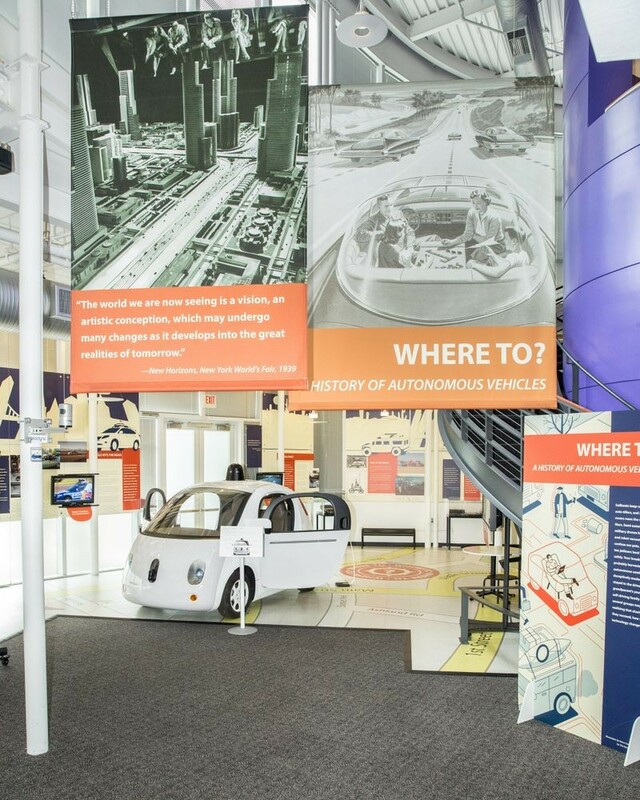 The Exponential Center at the Computer History Museum captures the legacy — and advances the future — of entrepreneurship and innovation in Silicon Valley and around the world. The center explores the people, companies, and communities that are transforming the human experience through technology innovation, economic value creation, and social impact. Our mission: to inform, influence, and inspire the next generation of innovators, entrepreneurs, and leaders changing the world. The Editorial Team at the Computer History Museum (CHM) consists of editors, curators, writers, educators, archivists, media producers, researchers, and web designers, looking to bring @CHM readers the best in computing and museum news.